The HP TouchPad, a brand new Wi-Fi tablet computer from one of the most established names in PC hardware, is balancing on that line like a tightrope walker. A blindfolded, juggling tightrope walker, whose rivals are throwing rocks at him in the hopes he falls off. You can’t swing a USB cable these days without hitting a new tablet that’s just popped up in stores, and now HP is pushing hard into that space in the hopes it can carve out a significant enough chunk of the market to make a go of it. Smart, or crazy? It’s honestly hard to tell. 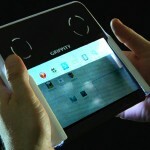 The TouchPad ($449 or $549, depending on model) is actually less like its peers than you might expect. With the vast majority of current tablets falling into either the Apple iPad or Google Android camp, the TouchPad stands alone, for better and also for worse. 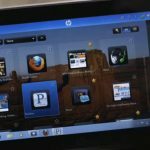 The TouchPad runs HP’s webOS technology, the same software that powers the Palm Pre smartphone family (HP bought Palm in 2010, largely to acquire webOS). It’s a unique way of approaching work and fun on a mobile device, with active applications – be it an e-mail program, a Web browser or a game of Angry Birds – organized into virtual on-screen cards which can be moved around, stacked, brought to the forefront or swiped closed as you see fit. It’s clean, intuitive and is certainly one of the TouchPad’s coolest features.